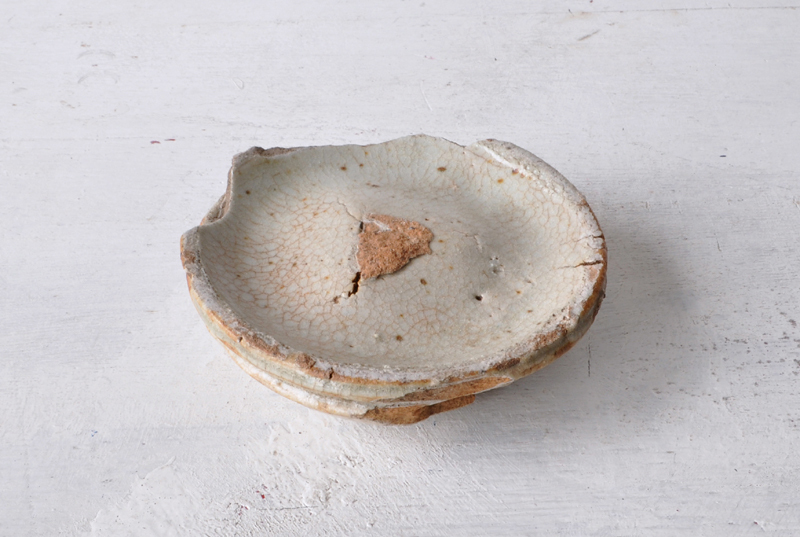 MUJI SHINO PLATE (Dealer: hotoke antiques) – Incompletely perfect lump of three Muji-Shino (Plain Shino ware) plates (and kiln-tool at foot) stuck on together as an excavation thrown away in kiln-site originally. Early Edo period, 17th century, Japan. Besides its coincidental formative landscapes, quite an elegant feel like subtly moist texture of what Muji-Shino’s skin is, though dry actually. Although such an elevation on top surface, usable subtly as a refined plate for a little side dish (for sake or tea). Enjoy.